The Wilmington Advocate dated February 19, 1883. There are many persons who even yet do not fully understand how the terrible affair of Friday could have occurred. The first man who knew anything concerning the break was the pump man, who is located at the bottom of the shaft, and whose duty it is to keep the water out of the shaft and see that the loading of the coal cart goes on properly. He had just sent up a load of coal, and upon going back to the pumps he found the water was rising rapidly, and the cause, he thought, was a lack of steam power in the engines above. He accordingly went up and saw the engineer, who said he had on as much steam as usual. The engineer stepped into the cage and went down to see what was the matter, and to his astonishment he found the water unto his waist and rising rapidly. He also found a number of miners who had come to the shaft to escape. An alarm was at once given by the "shovers," and all made for the top. The big whistles of the engines were sounded three times, and the little hamlet recognized it as the signal that the mine was flooded. Nearly four hundred distracted women and children gathered in a few minutes, and the heart sickens when imagination paints the scene that followed. The water in the mines was rapidly rising, and the stealthy stream had swoolen into a roaring torrent. The miners had received a late warning, and they started, some toward the main shaft and others toward the air shaft, a little west of it. The tide met them before more than twenty had reached the principal exit. Some had lingered to warn friends or to collect tools. The rushing water, which was descending like an Alpine torrent, with the impetus given to it by a fall of eighty-five feet, struck many of the unfortunate victims, whirling them away, and dashing them against the blackened roof with irresistible force. Some struggled on with the seething water up to their arm pits, but at points, where the roof sloped downward, they found the waves touching the top, and recognized the terrible underground trap. One man dived three times under the sloping roof and finally rose in the mine shaft and climbed into an elevator. He was a good swimmer and knew the locality perfectly, hence he was the only one of those whom the waters had shut off who escaped when hope had deserted everyone else. After thirty-eight days of pumping, the mine was emptied of water and preparations made to raise some of the bodies. The number of known victims total seventy-four, twenty-eight of which were recovered. The mine entrance was sealed. 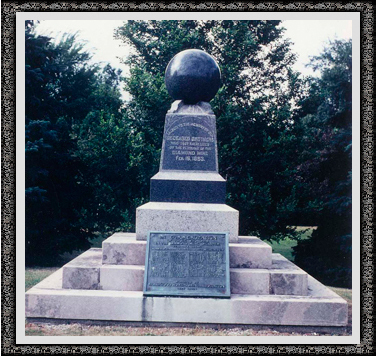 A monument to the lost miners was erected some fifteen years later. In 1898, a monument to lost miners was erected on the north side of the old mine opening on what is now Route 113. The monument and land were purchased by the United Mine Workers of America. In 1926, a group of residents, under the leadership of their Mayor M.J. Donna, placed a bronze tablet on the monument on which the names of the victims were inscribed. Diamond Mine Relief Committee Report and Proceedings, May 20, 1883. "In behalf of the Widows and Orphans, and other dependents, left destitute by the unprecedented disaster at the Diamond Mine, on February 16th, 1883, we return our most sincere thanks for the many generous and disinterested evidences of kindness, by word and act, received from the many donors to the fund, and in conclusion, do assure them, one and all that the fruit of their noble and kind-hearted response to our general appeal shall be watched over and applied in the same spirit it was so generously given, until the last dollar has reached the purpose it was designated for by the donor."